The seller of today’s Nice Price or Crack Pipe FJ40 says that he’s been using it to plow his driveway for the past six years. He has something new to plow now, and so you’ll need to decide if his price for this Toyota truck plows your field. Everybody knows that when it comes to performance there’s just no substitute for cubic inches. Well, everybody but Colin Chapman (R.I.P. ), he never did get that. The extra cubes in yesterday’s 1984 Toyota H-Lux were provided by a surprising source, that being a 3800 V6 out of a Pontiac Grand Prix. Some of you declared it to be heresy and an unholy materassmony but in the end its sub four-grand price proved that even that odd marriage of convenience might work and the Hi-Lux took home a 67% Nice Price win for its troubles. Considering the success of that Toyota, let’s go with another one today. This time however, we’ve got one that’s all Toyota. For off-roading, America has its Jeep and Great Britain their jolly good showboat, the Land Rover. Japan, not wanting to be left in the dust brought the Land Cruiser to market to show that they too could make an vehicle that could pound your kidneys to mush after only a few miles. 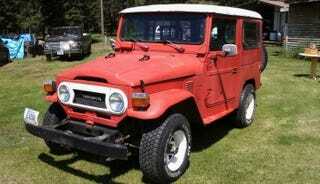 Actually, the present day Land Cruiser sold in the U.S. is a far cry from this 1977 FJ-40 model. Over time Toyota has morphed their sturdy off-road capable trucklet into a lux-o-barge SUV that seems more at home outside the Ritz than Ted Kaczynski’s insane in the end-grain backwoods shack. But it wasn’t always that way, and this two-door (well, four if you count the pair in the back), capped FJ looks to be a fine if unrestored example of that earlier breed. Offered up in Missoula Montana the truck is also about as plain and Jane as it can get. The engine should be the 4.2-litre, 135-bhp/210 lb ft OHV straight six, and backing that up is a four-speed stick. 4WD is facilitated via a two speed transfer case and solid axles on both ends carried on a stout ladder frame. Bang on it hard enough and you might break it, but this is pretty sturdy stuff. I guess it’d have to be as the ad claims this truck has seen the last six seasons behind a plow. Now that the owner apparently has a new Ox to grind, he’s putting the FJ up for sale. Both the body and running gear are claimed to be solid, although the seller says he’d replace the cap. That seems to have STDs (Strategic Tape Deployments) on the inside so perhaps the current one is cracked and inconveniently lets the rain in. The interior looks like it wouldn’t matter if it did get wet as it’s pretty much a hose-out environment. The two seats look pretty tired and are covered in those bad acid trip seat covers made popular by Pep Boys while the rest of the interior is all-metal mayhem. Nothing seems to untoward in there. On the outside the body looks complete and there’s no indication of rust in any of the pics. Sadly, Mr. Plow isn’t included. The seller estimates the truck has about 60K on the clock, however the Speedo doesn’t work so you’d just have to take his word for it. Rustic (but not rusty) FJs like this are frequently going for big cash these days. This one’s a little rough around the hedges, but perhaps its $7,500 price tag will make that acceptable. What’s your take on this FJ’s condition and that $7,500 price? Does that sound like a deal? Or, for that much would they need to throw in the plow? Missoula Craigslist, or go here if the ad disappears. H/T to mtdrift for the hookup!